Alysia, age 16, looks back as she sits amongst youth during a Catholic Mass on Sunday at the juvenile detention center. 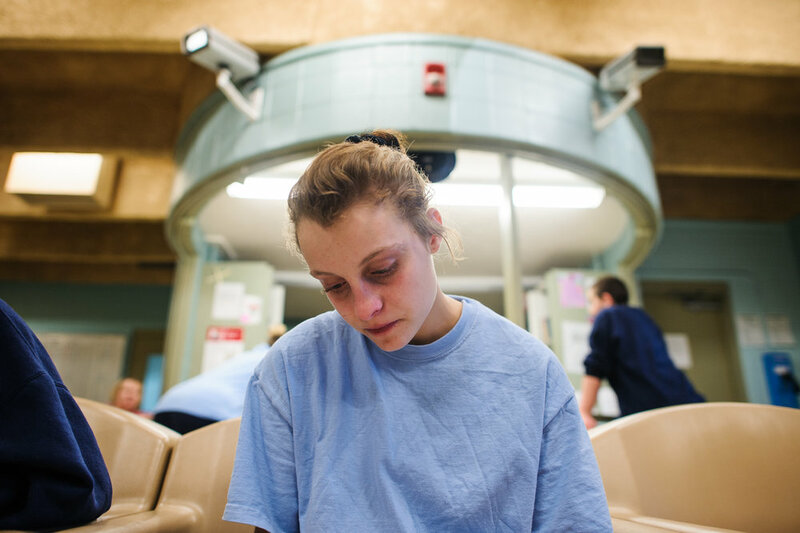 Alysia, age 16, lies on her bed in her cell at the juvenile detention center. Alysia, age 16, cries on the phone with her grandmother, as she tries to reach her mother who she has not spoken to since her arrest one week prior. “She just doesn’t care about me. Only herself. I want out of here,” says Alysia. Alysia, age 16, sits up during exercise in the gym at the juvenile detention center. Alysia, age 16, comforts Jasmine, age 15, who has just found out that her grandfather passed away. Alysia, age 16, sits in the communal area and draws in the girls’ unit at the juvenile detention center. Alysia, age 16, leans her head against a door as she stands in line with other girls in the cafeteria of the juvenile detention center in Albuquerque, NM. Alysia, age 16, stands in command call, or a line, to exit the girls’ unit, while Jasmine, age 15, leans and cries into Alysia’s back. Alysia, age 16, looks at her tattoo, as she sits in the communal area at the juvenile detention center. Alysia, age 16, and Jasmine, age 15, look into each other’s eyes, as they sit in their shared cell at the juvenile detention center. Alysia, age 16, sits inside the gym, as other girls play handball and basketball. Alysia cries and hugs her cousin, while her mother, Anastasia, (right) stands and cries. 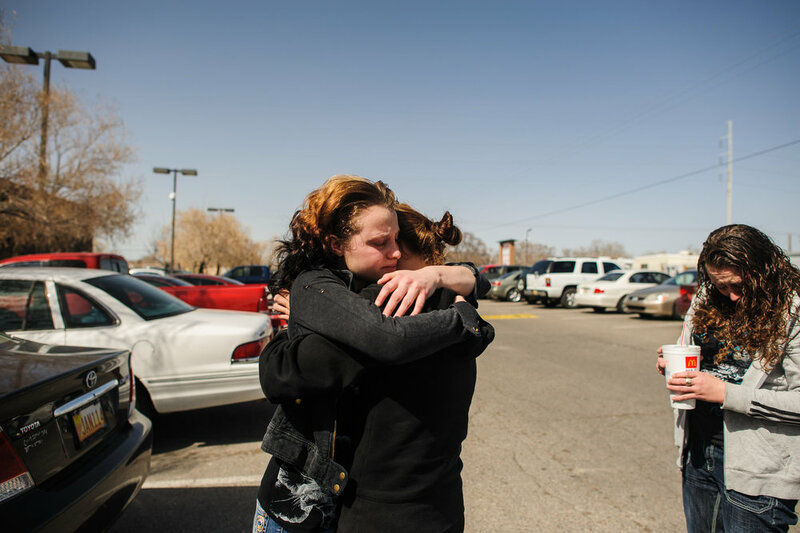 Alysia is given 10 minutes to hug her cousin and her mother before being transferred to a court-ordered treatment facility for 6 months where she will focus on getting sober from meth. A vase of flowers, a baby bottle, and a picture of Alysia’s mom and her brother who is child protective services sits on Alysia’s dining room table. Alysia, age 19, looks at Emmanuel, age 25, as he strokes her head while they sit on their couch. Alysia met Emmanuel when she was 17 after running away from foster care. They married when she turned 18. Alysia, age 20, puts on makeup in the morning, as her daughter, Leticia, stands beside her. Alysia, age 19, plays with Leticia, age 1, as Emmanuel, age 25, stands nearby in their bedroom. 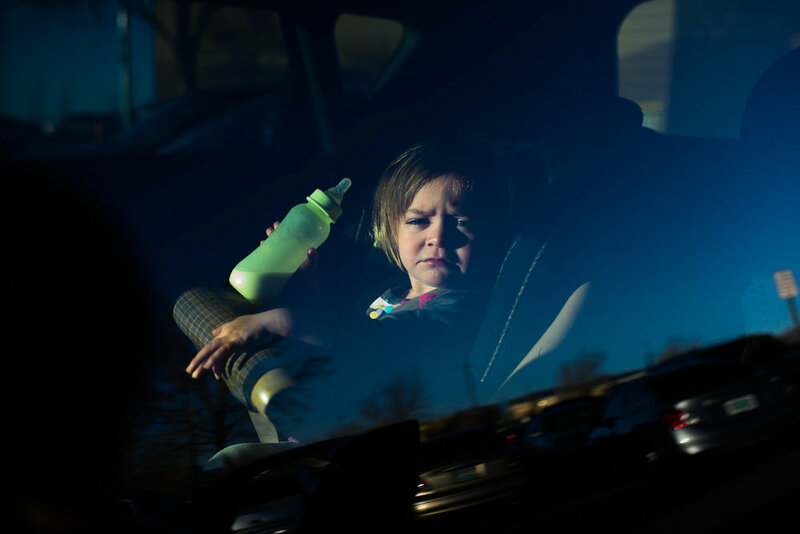 Leticia, age 2, sits in the backseat of Alysia’s car. Alysia, age 20, and Emmanuel, age 26, hold each other in the living room of their apartment in Albuquerque, New Mexico. A family photo taken at the zoo on the family’s refrigerator door. Leticia, age 2, waits for Alysia, age 20, at the end of the corridor, as Alysia walks towards her at their apartment complex. Leticia, age 2, lies on her back and holds two teddy bears.